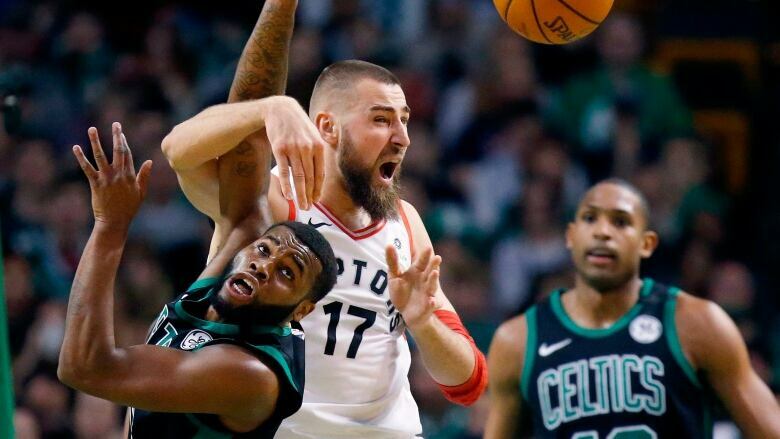 Marcus Morris had 25 points and nine rebounds before getting ejected in the closing seconds, and the Boston Celtics rallied to beat the Eastern Conference-leading Toronto Raptors 110-99 on Saturday night. The race for the top seed in the Eastern Conference is getting more interesting. Marcus Morris had 25 points and nine rebounds before getting ejected in the closing seconds, and the Boston Celtics rallied to beat the East-leading Toronto Raptors 110-99 on Saturday night. Jayson Tatum added 24 points, six rebounds and four assists as Boston posted its sixth straight win and moved within two games of Toronto for the top seed in the East. Terry Rozier finished with 21 points and seven assists. Both teams have six games remaining. They meet for the final time on Wednesday in Toronto. "We have to see them twice in a week, and we know it's going to be a battle," Rozier said. "But I say we don't let the standings dictate anything. We just go out there and we play and we go to war. That's what happened tonight." The Celtics got their 53rd win, matching their total from last season. Things got heated in the final seconds, when four technical fouls were assessed between the teams. Morris was hit with two and was tossed. Toronto's C.J. Miles and Serge Ibaka received one each. The kindling for the ejection came when Morris dribbled into the front court and was fouled with 10.9 seconds remaining. He then began jawing back and forth with Raptors players. "I just thought the game was over and just think the foul was a little too much, being down 10 with [10 seconds] left," Morris said. "It got a little heated." The ending did little to damper the performance of Morris or his teammates over the preceding 47 minutes. For Morris, it was his fourth straight game with at least 20 points — a career-high. DeMar DeRozan led Toronto with 32 points, seven rebounds and seven assists. Ibaka added 15 points and 10 rebounds. After giving up 24 points in the paint in the first half, the Celtics mixed in some zone defensively in the second half to try to limit the Raptors' opportunities. It was effective, and helped ignite a 10-0 Celtics run that gave them a 104-94 lead with 3:27 left on a layup by Tatum. "It had a lot [of effect]," Raptors point guard Kyle Lowry said. "We were stuck outside. They did a good job in the zone. We didn't make any plays. We had to figure it out. We just didn't figure it out quick enough." There were 15 ties and 20 lead changes in a game that was played within 5 to 6 points most of the night. "Whatever they can do, we can do," Morris said. "We just play hard. A couple guys stepped up. ... It was a good team win."